I found these awesome snowflake forms and snapped up some larger and smaller ones. Now I don’t know if you’ve noticed but while I do often make jewelry, I less often bead my own jewelry. The reason is simple. I just can’t seem to put winning combinations together. It’s something I’m working on but I have a feeling it’s something you either have knack for or you don’t. But that in no way stopped me from purchasing a bunch of beads to get after it. But it didn’t work. 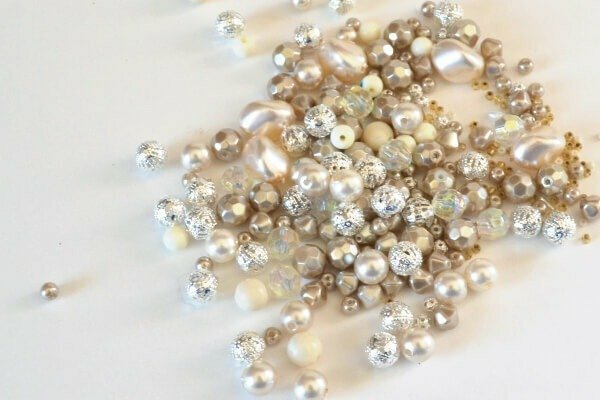 See the darker beige, opaque faceted beads? They were a part of that initial bead purchase and I loved them. So I decided to grab ’em and take them into a cheapie dollar jewelry store and found necklaces with a variety of beads on them that all matched my little lovelies. In the end, I’m SO happy with the results! So here is my big pile of beads. I added in the silver beads as I have TONS of them and cut the beads from the necklaces off. In the end I wound up placing them in a bowl because beads roll! Now they say that no two snowflakes are the same and I have to say that my ornaments will hold true to that adage. 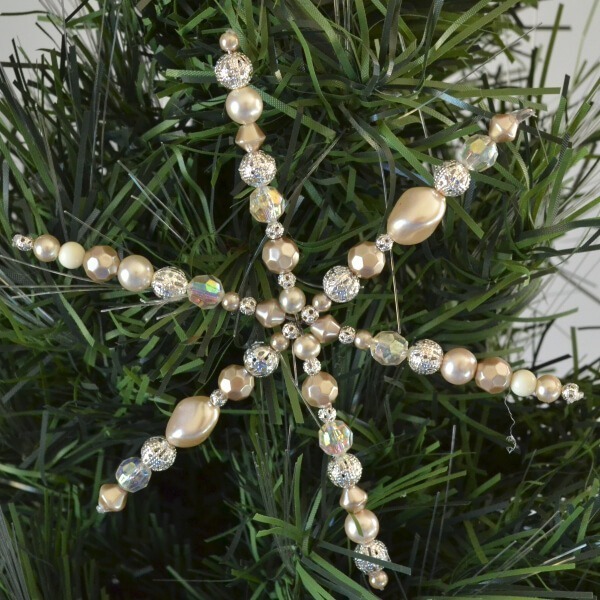 To make the ornaments each unique, work out a pattern and slide it onto one of the spokes of your form. You’ll repeat the pattern directly across, but make 2 different patterns for the remaining four spokes. 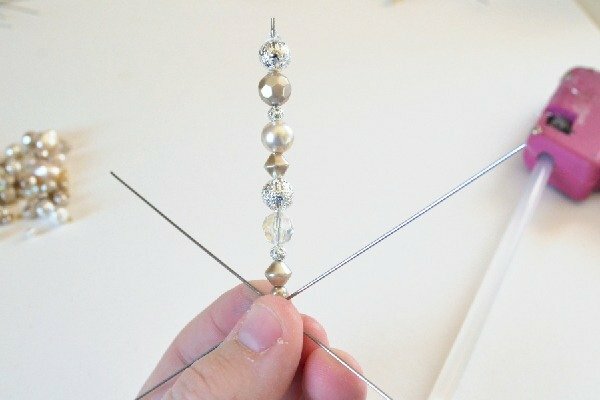 NOW… the package says to turn the metal to trap the beads on but I actually broke my jewelry pliers trying to do just that. I went and got my heavy duty, big mumbajumba needle-nose pliers from the toolbox and guess what… these suckers wouldn’t fold over neatly for anything in the world. So, instead I highly recommend removing the topmost bead an dabbing some hot glue onto the form. Slide the bead back on and hold firm until set. Place another daub on top of the bead attaching to the wire and then snip off the excess. On occasion I’d get a good wrap and for those ornaments I can loop string through so that they can hang, but to be honest mine will be just shoved into the tree to stand freely, anyway so I don’t mind. If you do want yours to hang you can try to loop all of the ends and use the best one, then hot glue and snip the arms that didn’t work out. And there it is all finished up! I can’t hardly believe how pretty mine are turning out and it’s all thanks to using beads from jewelry that already look good together! This isn’t exactly a quickie project. It’s more of a take your time making interesting patterns and then committing them, leisurely type of project. It would be great for kids because they can come up with some of the most interesting patterns! 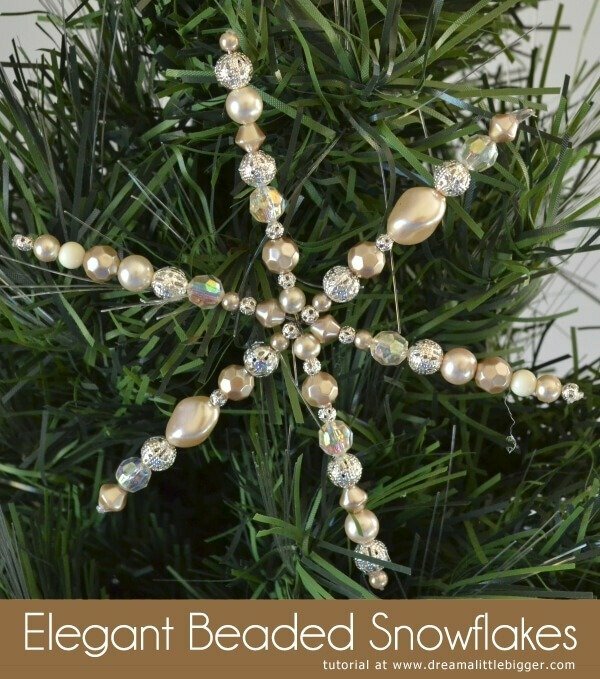 Will you be working up some of these beaded snowflake ornaments? They do have smaller forms, too, Mid! 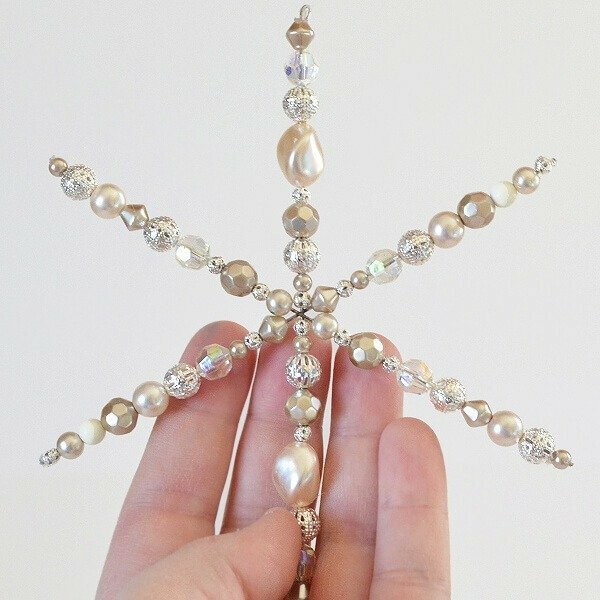 I think 4.5 inches but I bet you could just bead out to the size you’d want them :) Little delicate beaded snowflakes would be fab! Starting this for next Christmas! Thanks! How do you put the spokes together? You don’t have to. You purchase them ready to bead.